Steering and suspension refers to a complex system of components that connects the body of a car to the wheels. This system allows you to control the direction of your vehicle whilst limiting the impact of uneven road surfaces and vibrations on the car. This ensures passengers maintain as safe, controlled and comfortable a ride as possible. 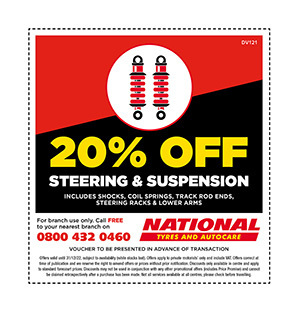 At National Tyres, we stock thousands of steering and suspension parts including CV Joints, CV Boot Kits, Drive Shafts, Hub Bearing Kits, Road springs, Shock Absorbers, Steering Racks, Bushes, Tie Rod Ends or Ball Joints. Should you need to replace any of these components, or would simply like one of our expert technicians to check your vehicle, book an appointment at your local National Tyres and Autocare today. Don't forget about our Price Promise to you – if you can find the same product at a lower price, in stock locally within 7 days of purchase – we promise to beat that competitor's written quotation. It can be difficult to recognise a problem with your suspension system given that loss of performance occurs gradually over a period of time, however due to the harsh environment in which this system operates, and the large number of varying components involved, it is essential your vehicle is checked on a regular basis. If you are unsure whether your car’s steering and suspension system is faulty, why not book a FREE visual safety inspection at one our branches? The inspection will only take about 10 minutes and there’s absolutely no obligation to get any work done at National. If you’d prefer, you can call your nearest branch direct on 0800 432 0460 to arrange an appointment.